When we were first trying to port the Midi Fighter mapping onto nanoPAD2, we also thought of porting that mapping for users who do not have any midi controller at all. So our quest began with solely two purposes; First: How can we turn our keyboard into a MIDI device so that it can do all possible things that can be done via other midi controllers and Second: Porting a solid Traktor mapping onto keyboard to showcase the power of this thought. While trying to work on this thought of ours, we tried and tested various software both paid and free for finding the one with most options and compatibility to work with. And finally in this post we will be discussing results of our quest for using keyboard as a Midi Controller. In order to showcase our experiment we will be showing you how you can turn your keyboard into a Midi Device, and that too not just any other midi device, a Midi Fighter! So after going through this post you will be able to use your keyboard to create amazing sounds effects and build ups just like Ean does using his Midi Fighter. Do we need such setup? You already own a MIDI Fighter and use it with instant gratification mapping. Then this method allows you to use your keyboard as a second MIDI fighter with classic mapping. You don't own a MIDI Fighter but own some other MIDI Controller. 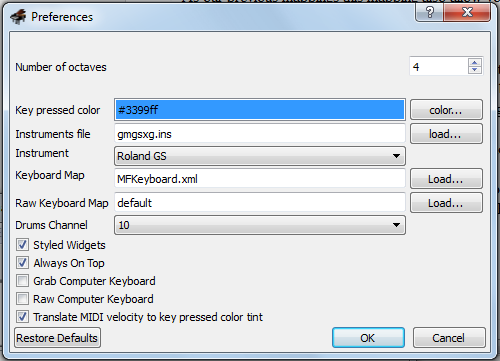 Then this method allow keyboard to serve as an extra MIDI controller for free. You neither own a MIDI Fighter nor any other controller. Then this method allows you to do advance things with the all times available MIDI device, you keyboard to control any music software. What we need before we begin! #2. Keyboard to MIDI Controller: After trying out multiple software for this purpose, we settled onto Virtual Midi Piano Keyboard. This one is the best out there and you can download it for free from this link. #3. Keyboard layout: Our custom made keyboard layout for the above discussed software. Download it form here. #4. Midi Fighter Traktor mapping: Finally to work with our setup, we ported the official Midi Fighter Classsic mappings. It took a great deal of studying the mapping and carefully putting it together so as to make it work on our nanoPADs! If you care about our work and want to support future mappings please download a Donate Version! for just $1. We worked really hard to create this mapping from scratch. It took countless hours in studying each and every keypress, values, and logic to come up with a workable mapping that can independently capture almost all functions of the more advance midi controller. Therefore we request you to please purchase our mapping at just $1. This will not only be our thank you token but will help us to put more effort into coming up with more such advance mappings! Just like our nanoPAD2 mappings for Midi Fighter in this version we used two rows of 8 buttons each. Keys U, I, O, P and 7, 8, 9, 0 are mapped to CUE 1 to 8 respectively. Keys 1, 2, 3, and, 4 are mapped to SHIFT, SYNC, PAUSE, and , PLAY respectively. Keys Q, W, E, and, R are mapped to REC, MASH, FILTER, and, ECHO respectively. As our previous mappings this mapping also allow you to control all four decks. Press SHIFT plus PLAY to select the deck you want to control. SHIFT plus SYNC or PAUSE will bend the track if beat goes off. Press REC button to drop a loop (8 counts recording). If you stop the track now, the recorded loop continues to play. After recording press SHIFT plus REC button and now all the eight cue points enable juggling through the recorded sample. Press REC button for stop playing the recorded loop. Use CUE 1 – CUE 8 for storing cue points and SHIFT plus CUE button to deleted that cue point. How to make our setup work? While using this mapping you need to keep in mind that your VMPK window should be on top of your Traktor window and VMPK preferences should be set as shown in the screenshot below. 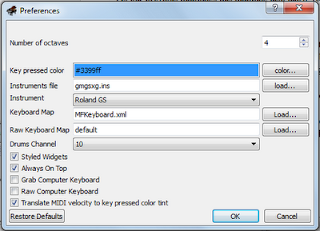 Also in VMPK, Click on Connections in Edit Menu, and set Output MIDI Connection drop-box value as Out to MIDI Yoke: 2. This setup does not replace the use of Midi Fighter nor it tells users to use Keyboard instead of using a actual Midi Fighter. This is just to help users who are looking for doing amazing things but do not have access to advance stuff.